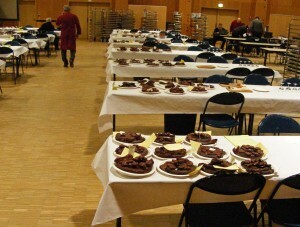 Ruddy-black slices of sausage stand neatly piled up across plate after plate on long tables, in a sports hall on a Saturday morning in mid-March. Around 10am little groups of four or five people take their seats at one end of each table, and arrange their papers, and their forks. 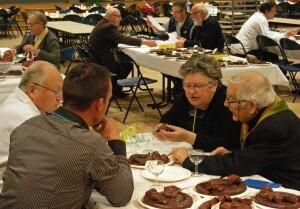 They have work to do, for they are judges at the annual Foire au Boudin in Mortagne-au-Perche in southern Normandy, an event, now in its 50th edition, that has no serious challengers as the world’s foremost competition for craft makers of boudin noir, black pudding, blood sausage, in all its forms. Mortagne is an ancient little town of sandstone towers in the Perche hills, a pocket of lush, rolling greenness about two hours west of Paris. Napoleon spent one night there in 1811, which must have caused a stir. For centuries the Perche was a fought-over borderland between English-held Normandy and the French heartland around Paris, and later on between Protestants and Catholics in France’s Wars of Religion, as a result of which many of its hills are topped by extraordinary fortified manor houses, domestic-scale castles. It is also the home of the Percheron horse, and in the 17th century sent more people than any other part of France to Quebec – it’s said that every Quebec family has at least one Percheron ancestor, and recently the Perche has built up a tourism niche of its own with a heritage centre to help Quebeckers looking for their forebears (even Celine Dion has been through, I was told, checking out her roots). Otherwise, the Perche remains a very rural, placid corner of deep France, with a slightly remote feel and often largely unnoticed by the rest of the world, at least until the last five years or so, when a few Parisians and foreigners have finally become aware of its attractions as a weekend escape. And it remains very properly attached to its gutsy traditional foods and the fruits of its soil. The Perche produces some of the best (but, typically, least known) Normandy ciders, lighter and more subtle than many from further north. And above all it’s famed for its boudin noir, soft, black blood sausage, of which Mortagne can rightly claim to be world capital. Blood sausage is said to be the oldest refined meat product in Europe, some say first made by ancient Celts out of the blood of their enemies. After years of being ignored by many as coarse, old-fashioned fare (or just gross), this – when it’s done right – wonderfully rich, deep-flavoured meat-form has at last become positively fashionable again, at least in Britain and Ireland, thanks to the interest shown by creative cooks in reviving properly earthy traditional foods of all sorts. And this has focussed an all-new level of attention on Mortagne’s annual fair. The Foire au Boudin is a wonderful, classically French celebration of food – especially local food – as culture and as something to be savoured, treated with deep respect and enjoyed. French boudin has naturally been the main focus but the competition is also generously open to artisan sausage-makers from other countries – including, in 2014, eight entrants from the UK and seven from Ireland – and German and Austrian makers in particular have often won major prizes. ‘The food thing here is hilarious’, said John-Paul Habermann, the Bavarian-born head of Franconian Sausages, suppliers to many London restaurants and a first-time UK-based entrant in the 2014 Foire. ‘They’re obsessed with food… and very friendly. Everybody shakes your hand, they’re really happy you made the effort to come here, and to participate…’ The 30 members of the Confrérie are all co-opted, becoming full members only after being involved in the Foire for several years. None are professionally involved in boudin or other meat trades. This is one thing that makes Mortagne much better, says John-Paul, than the kind of food fairs and award-giving events that have been multiplying in, for example, Britain, nearly all of which are in some way industry-sponsored and so ultimately always promoting something. The Foire au Boudin, in contrast, is run solely by black pudding connoisseurs, with no axe to grind other than the search for the perfect pudding. One index of just how low-key Mortagne can be is the lack of merchandising. John-Paul’s colleague Neal Salter had been looking for souvenirs. At any food event in Britain, he pointed out, there would be T-shirts, pins, stickers, aprons… Whereas here all he’d been able to find was one pretty rudimentary key-ring. Organization of the Foire au Boudin appears to be a marvellous combination of improvisation and thoroughness. It’s peculiarly difficult to get concrete information on what’s going to happen. The advertised dates for this year’s Foire were the 15, 16 and 17 March, so I arrived on Saturday 15th, but was told that the competition had actually begun the previous afternoon with préqualification, in which the weakest of the 515 entrants were winnowed out, and that nothing much would be left to happen by Monday. 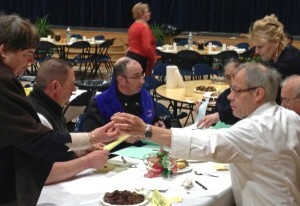 As contestants Neal and John-Paul were aware they had to be in Mortagne by the Friday, but hadn’t been told that the main judging would be on Saturday. And half-way through the Saturday morning, after hearing they had almost certainly won a medal, they discovered that if they wanted to collect it they would have to come back two weeks later, in the last weekend in March, when the whole of the Confrérie would parade through the town in full regalia, ceremonially present the medals to this year’s winners and ‘knight’ new chevaliers of the black pudding, and then invite them all, as an Austrian former winner told us, ‘to the best meal you’ve had in your life’. There’s nothing shaky or casual, however, about the core of the weekend’s proceedings, the concours or competition itself. On the contrary, each piece of blood sausage is assessed with magnificently Cartesian rigour. As they are officially accepted each pudding entered is stripped of all labelling and given a number, to ensure that they are ‘completely anonymous’ and avoid any hint of favouritism or improper dealing. Though the competition is international, all the different entrants are not just judged all together, since, as traditional French ideas of terroir or the local origins of foods naturally dictate, trying to apply the same across-the-board criteria to products from completely different places would be pointless, futile, a demonstration of ignorance. Instead, France is divided into seven zones, while other countries each constitute their own region. 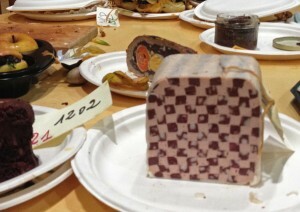 Beyond this, all the puddings in each region are also divided into three categories: traditional, ‘innovative’ (departures in ingredients from the strictly traditional, but still recognizable as a sausage) and ‘creative’, ‘without bounds’, which includes extraordinarily intricate, sometimes bizarre gateau-like concoctions completely remote from anyone’s conventional idea of a black pudding. The creative category is also entirely international, not tied to any region. And then for each pudding entered, each plateload, there is a feuille de classement or mark-sheet, on which every one of its qualities – colour, too much guts, too little, how well it cuts, quality of ingredients, their balance, flavour… is scored in fabulous detail. The jurés for each table – stout men with beards, local ladies, chefs, in their professional whites, who often act as jury secretary – set about their task with great dedication, seriousness and precision, as well as obvious enjoyment. Watching them as they deliberated, sometimes in arguments that looked to be getting heated, was truly fascinating. Then, after about three hours of sampling and judging black pudding, the main deliberations were all over, and they broke… for lunch. 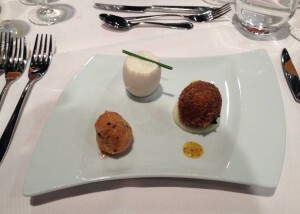 And in the evening, there was a special dîner-spectacle to mark the 50th anniversary, the first course of which featured utterly exquisite, very delicate little gourmet creations, all based, of course, on black pudding. Outside and around the main hall for the competition was the rest of the Foire, with as a centrepiece a circular stand from which all Mortagne’s spectacular charcuteries presented their wares – boudins with apple, walnut, figs, chestnuts, apricots… There were demonstrations of pudding-making, cider-stands, and a special stand showcasing Quebec produce, with a maple-syrup café. Around all this foodie-stuff, though, were all the usual, indispensable offerings of any French country fair, bizarrely mixed together – stands selling used cars, tractors, insurance, window frames, clothes and anything else you could think of, including gravestones and swimming pools. One other essential element of the fair was left till Sunday afternoon, at Mortagne’s racecourse, the Concours du Plus Gros Mangeur du Boudin, the competition to see who could eat the maximum possible amount of boudin noir in 15 minutes. Competitors included some very large country boys, and 72-year old Maurice Romet, a pixie-like old character with a long beard who first took part in 1966. Maybe it’s just that some parts of the entrenched French attitudes to good eating are impossible to leave behind, but this contest had a less gross style than the kind of mad hot-dog eating competition that turns up on trash TV: when the whistle sounded for them to start, old Maurice and several other contestants seemed almost to carry on chatting, boudin in one hand and a glass in the other. Others worked harder at it. Major news at the 2014 Concours was that eight-times winner Joseph Jourdain came only a poor third, and announced his retirement from competitive boudin-eating. The new champ is Raymond Reine, a big lad with large red ears, who put away all of 1.5 kilos of boudin in his quarter hour. And black pudding is not the only gutsy food that has its place of pilgrimage in the Perche. 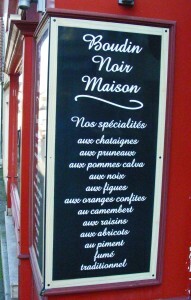 Mortagne may be France’s capital of boudin noir, but Longny-au-Perche, just 18 kilometres east, is its capital of another traditional delicacy, which, however, hasn’t yet enjoyed any revival in fashion – tripe, real guts, prepared with many different seasonings. 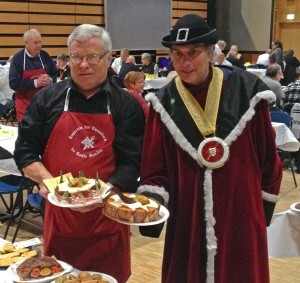 It too has its Confrérie of local gourmets with eye-catching regalia dedicated to preserving local traditions, and it holds an annual Foire aux Tripes, which has taken place as I’m writing, on 1 May. In Mortagne, the next Foire au Boudin will take place officially on the 14, 15 and 16 March 2015, although for those in the know the competition will actually start on Friday 13th. 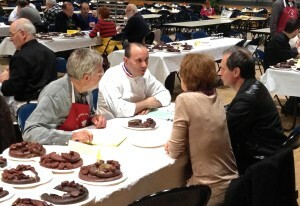 And for anyone wishing to know more about the competition (or even to enter), check out http://www.boudin-mortagne.com. Makes me mouth water. An Irish breakfast isn’t an Irish breakfast without blood pudding. Thanks for the appreciation. You should make the Mortagne pilgrimage when you can! A while back you wrote a comment on my blog piece, about the black pudding festival in Mortagne au Perche – in case you’re planning a visit, I’ve just realized that at the end of my post I said that the next festival would be in May 2015 – which is completely wrong, as I hope would be understood from the rest of the piece – it should say March, and I’ve now corrected it. Sorry about that! Wow! So interesting… I am sharing this post with friends and family who love black pudding! That’s great… maybe next year I can suggest a tour! You kindly wrote in to say that you liked my blog post about the Mortagne-au-Perche black pudding festival – I’m writing again now, just in case you’re planning a visit to Mortagne, because I’ve only just noticed that at the end of my piece I said that the next festival would be in May next year – I’m afraid this should of course have been March, as I hope would be understood from the rest of the post – Very sorry about that!